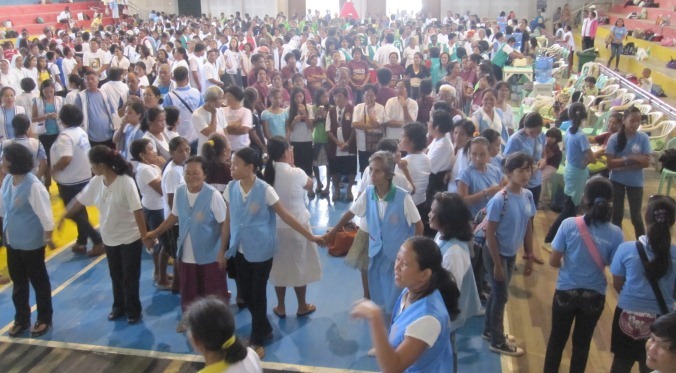 On September 15, 2012, and under a downcast sky, the 15th Diocesan Biblical Congress started with a parade participated in by various vicariates of the Diocese, namely: the Vicariate of St. Michael (composed of the towns of San Miguel, Mahayag, Dagohoy, Danao, San Miguel-Dagohoy, Magtangtang-Danao); the Vicariate of Our Lady of Consolation (Guindulman, Guinacot, Jagna, Lonoy, Duero, Payao, Anda); the Vicariate of the Holy Child (Ubay, San Pascual, Biabas, Aguining, Pitogo); the Vicariate of St. Paul (Getafe, Buenavista, Inabanga, Bugtong-Lubi, Pasanan, Cawayan-Inabanga); the Vicariate of St. Anthony the Abbot (Carmen, Sierra Bullones, Abachanan, Bugsoc, Pilar, Nueva Vida Este, San Isidro-Pilar); the Vicariate of St. Joseph (Candijay, Cogtong, Mabini, San Rogue, Alicia, La Hacienda, La Union); and lastly by the Vicariate of the Blessed Trinity (Talibon, Bagacay, San Agustin, Bien-Unido, Trinidad, Hinlayagan Ilaya). God is good! Heavy rains poured down when the participants were already inside the Blessed Trinity Cathedral. Registration started very early at 6:00 o’clock in the morning and went on even after the parade. 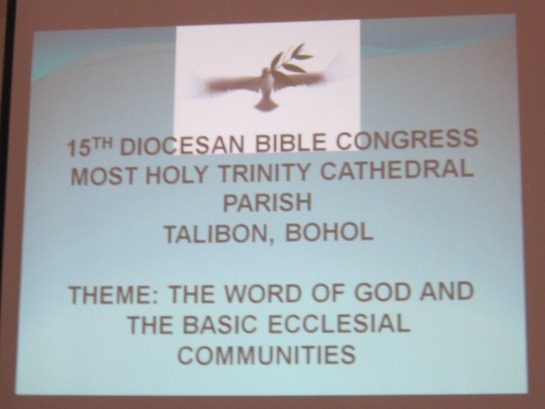 A “Bible Enthronement” followed led by the Director of the Diocesan Commission for the Biblical Apostolate of the Diocese of Talibon, Fr. Alexander Auxtero. Fr. Alex was assisted by the Parish BA Staff. A procession was made of the Holy Bible and a short ceremony for the enthronement was observed with specific prayers said and songs sung. Everyone sung with their hearts and the melody of the songs reverberated throughout the Cathedral’s walls. Words of Welcome were given by Talibon’s Municipal Mayor, Hon. 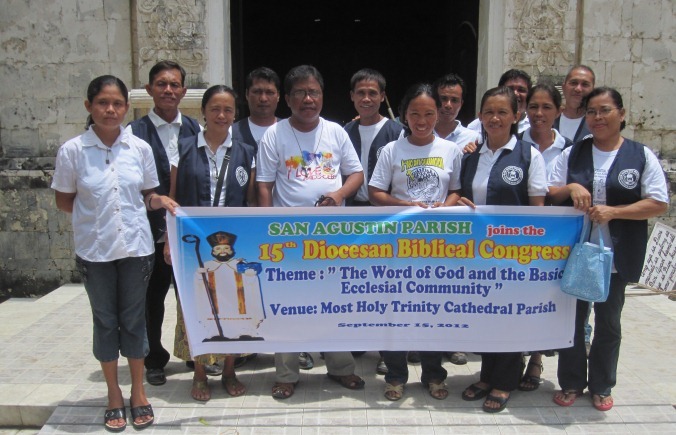 Restituto B. Auxtero; representing the LGU-of Talibon followed by Rev. Fr. Jonathan D. Pacudan, Parish Priest, representing the PPC-Talibon. More than 20 priests concelebrated in the Holy Mass that followed after the welcome messages. It was led by no other than the Bishop of Talibon, Most Rev. Christian Vicente F. Noel, D.D.. The Biblical Congress may be the last big affair that the bishop will be attending for he will be retiring by December, having served the Diocese for 26 years. A short talk ensued after the Mass. The guest speaker, Rev. Raymund B. Estillore was introduced by Rev. Fr. Gregorio Mendez. Rev. Estillore expounded on the roots of the Bible and of its role in the basic foundation of the life of every Christian, especially of the Catholic faithful. 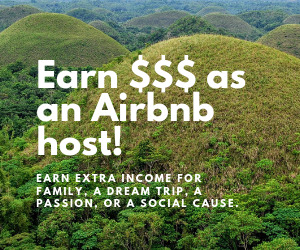 His talk lasted for an hour and then an Open Forum followed which lasted until 12:00 noon and then the crowd dispersed for lunch; informed to convene at Talibon’s Cultural Center at 1:00 P.M. for the rest of the affair’s activities. 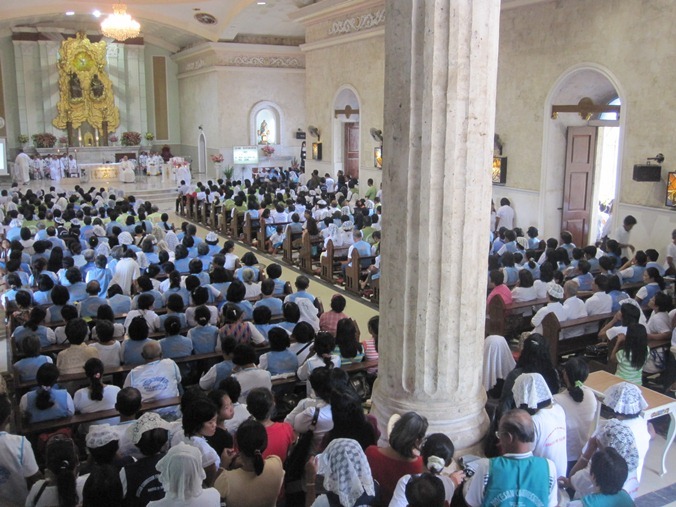 From 1:00 to 3:00 P.M., the huge Bible Apostolate members joined in the workshop, and within that time, awards and acknowledgements were given: to groups who arrived the earliest; the biggest contingent; and various awards that the committee have lined up to enliven the affair. Fr. 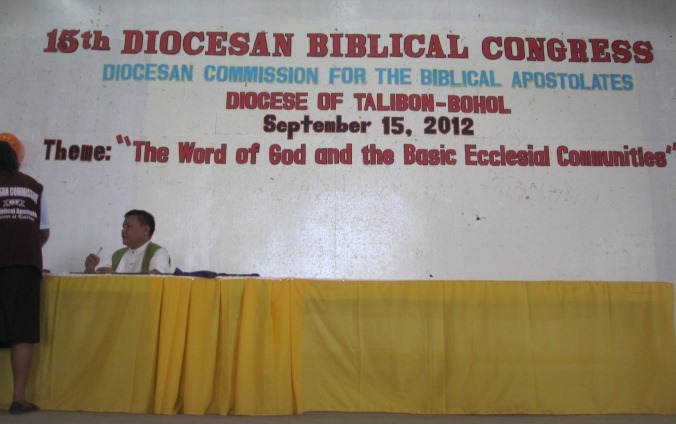 Alex Auxtero then thanked all present for answering the call of the 15th Diocesan Biblical Congress.